I had a revelation last night…that perhaps y’all don’t read my stuff just to get inside my head. That is to say, maybe you’d like to read some factual stuff. I know: I rant, I rave, I gush, I cry, I rage against my Cause du Jour. But I just received a press release from NYRA, and it occurs to me that you, my readers, should know about the info contained therein. 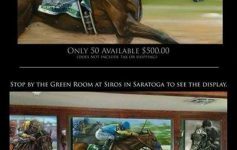 ELMONT, N.Y. – May 27, 2014 – MSG+ and The New York Racing Association, Inc. (NYRA) have teamed up to deliver viewers enhanced coverage of the New York racing scene throughout the year, including comprehensive preliminary coverage of the June 7 Belmont Stakes. In April, MSG+ rolled out the National Racing Report, a show hosted by Jason Blewitt, Richard Migliore, and Andy Serling that recaps top stakes races throughout the country. This weekly show continues to air Monday and Tuesday nights at 6 p.m. 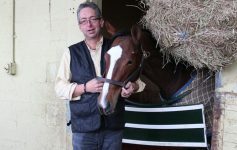 This was followed on May 21 with the unveiling of a newly revamped daily show —Aqueduct/Belmont/Saratoga Insider – hosted by Blewitt and Migliore.In addition to recapping the day’s racing, the show also focuses on what to look for, including races of interest and horses to watch, and incorporates viewer commentary via Twitter. The Insider airs live on racing days at 6:30 or 7 p.m.
MSG+ looks forward to bringing viewers several days of live racing throughout the year, including all three New York-bred Showcase Days — Big Apple Showcase Day on May 31, Saratoga Showcase Day on August 24 and Empire Showcase Day on October 18 at Belmont Park. The centerpiece of the MSG+ live racing coverage is Friday Live at Saratoga, which will air Fridays from 5 – 6 p.m., beginning July 25, and encompass some of the historic track’s best racing, as well as preview the weekend’s graded stakes action. With California Chrome hoping to become the first Triple Crown winner in 36 years, MSG+ will telecast live the Post Position Draw Show on June 4, the Wednesday before the race, from 11 – 11:30 a.m. Racing fans can also look forward to an hour-long special “Belmont Insider: Belmont Stakes Preview,” which will air on Friday, June 6 and be repeated throughout the evening. Racing fans can also look forward to the Belmont Stakes Preview Show, which will air on Friday, June 6 at 7:30pm and be repeated throughout the evening. MSG Networks is the exclusive local television home of the New York Knicks, New York Rangers, New Jersey Devils, New York Islanders, Buffalo Sabres (Upstate New York only), New York Liberty and New York Red Bulls, and the official regional sports networks of the New York Giants. MSG Networks also telecasts over 135 live college basketball games and over 35 live college football games from top national conferences (ACC, SEC, Big 12, Big East), as well as horse racing, boxing and award-winning original programming. In 2014, MSG Networks received 16 New York Emmy Awards, including 14 for MSG Network and one each for MSG+ and MSG.com. MSG Network’s 99 Emmys over the past seven years are more than any single network or station in the region during that time. For more information, visit www.msg.com and www.facebook.com/MSGNetworks and follow @MSGNetworks on Twitter. Previous Article Triple Crown Thoughts: Not Every Horse Can Turn Chrome into Platinum. Next Article For NYRA’s Starting Gate Crew, Every Horse Matters.